Having served the World Evangelical Alliance (WEA) for the past decade as its Director for Leadership Development and Director of the Leadership Institute, Dr. Rob Brynjolfson accepted an invitation to head up the global expansion of a leadership program at a Canadian-based Seminary. The WEA family expresses its deep gratitude for his many years of faithful service and the important contributions he made, especially in the area of Alliance Development. Starting in April, Dr Brynjolfson will be directing the global expansion of the ‘Immerse’ program at Northwest Baptist Seminary in Langley, BC, Canada. It is a competency and context-based non-traditional program that allows Christian leaders to obtain an accredited degree while serving in their local ministry. While with the WEA, Dr. Brynjolfson has focused on the development of the WEA Leadership Institute curriculum, a specialized training program for Evangelical Alliance leaders with core courses on Building Strong Partnerships, Effective Public Engagement, Association Leadership Essentials. As part of the Alliance Development Department, he was also overseeing the WEA Resources Site and he was instrumental in the creation of the Evangelical Alliance Development Indicator tool that helps Alliances self-evaluate and identify their strengths, but also areas with more potential to develop. Dr. Rob Brynjolfson teaching at the Fellowship of Emerging Leaders Program 2017. 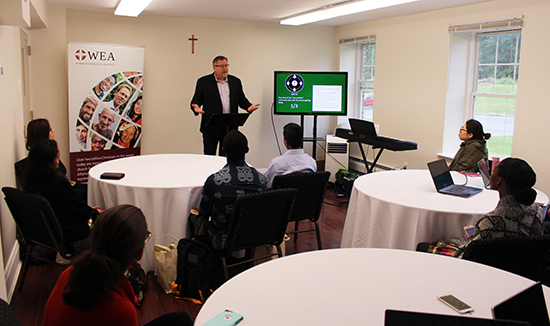 More recently, he headed up the Fellowship of Emerging Leaders (FEL) program, a 12-week onsite training program held in Dover, NY, in which 10 younger leaders from Evangelical Alliances in eight countries participated. And with his missionary background in Latin America, he was well-positioned to serve as liaison to the Latin Evangelical Alliance and the various Spanish-speaking Evangelical Alliances in the region.